Unarmoured Saxon Warriors. 32 Multi-part miniatures. This also a good bargain, as similar to the saxon Thegns box, with 32 unarmoured bodies, and 48 heads, 4 with helmets, 4 with hats and 4 are bare. It also has 8 bows and quivers, as well as 4 bigger axes, 4 slighter smaller axes and 4 pennants. 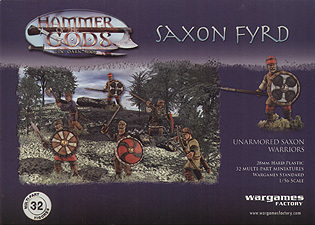 The bodies are the same as the Viking Bondi.it's the separate weapon sprues that make it saxon. It is the same sprue as used for the saxon Thegns which has the armoured bodies in it. This would be good for anglo saxon or Anglo Danes in SAGA, especially if mind with the saxon Thegns, though it could also be combined with a Viking box, as it has different weapon sprue and also bodies of saxon Thegns.